==== Goals: mini bio gas continuous, integrated and compact system for the anaerobic digestion of organic matrices. ====Usable in: small manufacturers of food and agricultural sectors, as well as urban and peri-urban settlements, COD treatment and remediation industries in water bodies, manufacturing industry of the agro-food chain. ====All IP set: Link . ====This invention relates to a method and to a device for the implementation of said method, to decompose and to selectively extract methane, carbon dioxide, NPK salts (nitrogen, phosphorus and potassium salts) of various titre and clarified water, from an organic matrix; said components will be the raw material for further industrial processes. The method is characterized in that it includes the following phases: â€¢ implementation of a hydrolytic phase, constituted by the fission action by means of the water, by hydration; â€¢ implementation of a acidogenesis phase generated by means of specific bacteria; â€¢ implementation of a acetogenesis phase generated by means of specific bacteria; â€¢ implementation of a methanogenesis phase by means of specific bacteria, with a simultaneous gravimetric separation of a mainly oleic phase, lighter and of a predominantly protein phase, heavier; â€¢ gravimetric separation of solutions of said NPK salts of different titres â€¢ taking of clarified water. The device is characterized in that it comprises a basin (1) divided into various zones (V1), (V2), (V3), in each of which biological reactions occur, in accordance with the claimed method, said zones being all communicating and identified by suitable separation baffles, in particular: â€¢ a first baffle (2) extended from a first end (1a) of the basin to a second end (1b) of said basin (1), dividing it into two parts; â€¢ a second baffle (3), of height equal to said first baffle that divides one of said parts in a first zone (V1) and in a second zone (V2) extending from said first end (1a) of the basin (1) until it reaches the vicinity of said second end of the basin (1), so that said two zones (V1) and (V2) are communicating through an opening, of substantially vertical development, between the end of said second baffle (3) and the second end (1b) of the basin (1); â€¢ a plurality of baffles (4) and (5) transversely arranged to said first baffle (2) and inside a third zone (V3), delimited by said first baffle (2), said third zone (V3) being placed in communication with said second zone (V2) through a transfer pipe (6), positioned at about half height of said first baffle (2); â€¢ two blocks (B) and (C), placed in the upper part of said basin (1) and provided by taking means (12, 12a, 13, 13a), each of said blocks (B) and (C) including a plurality of vertical pipes and being fitted to carry out a gravimetric separation of the gases that are generated during the treatment of said mixture; said baffles (2) and (3) and said transfer pipe (6), by identifying a path crossed by the liquid mixture to be treated, that runs into the beginning of said first zone (1) where it is placed an inlet pipe (7) of the liquid mixture to be treated and comes out from various points of said third zone (V3). 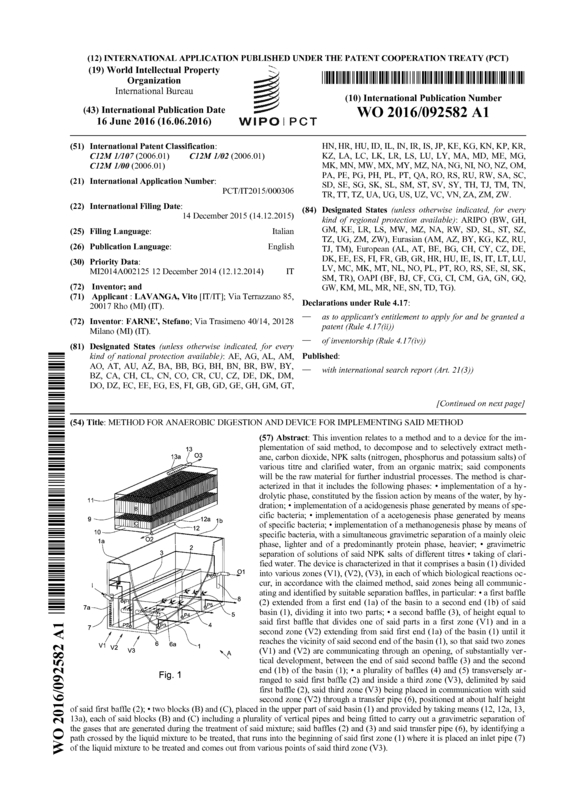 Page created at 2019-04-25 14:02:19, Patent Auction Time.